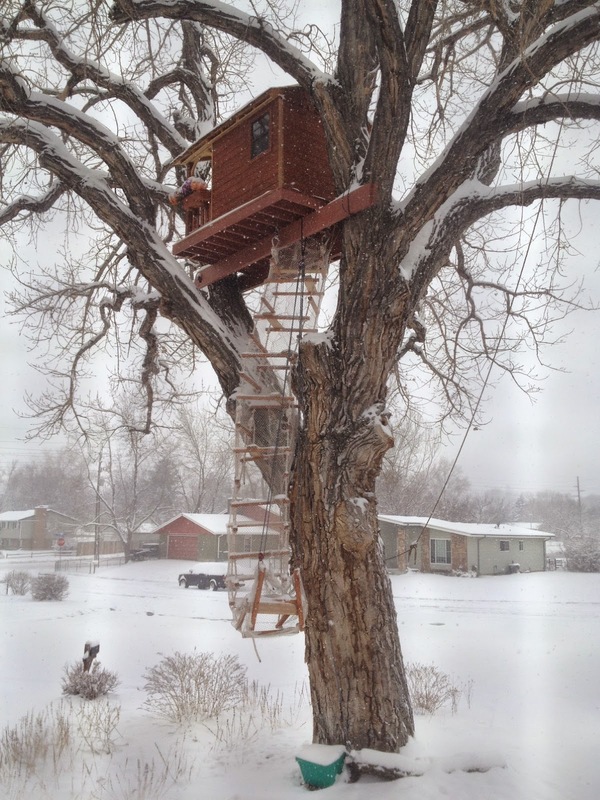 I've been meaning to get up into the treehouse and take a few pictures to see what the winter's wrought -- and fulfill requests for a bit of video showing how it feels to climb up and hang out in the tree. I was finally able to get up the other day; I lowered the ladder and ascended with no problems, inspecting things as I went. Nothing was out of place. I climbed up to see what mischief the squirrels and raccoons might've been up to inside the treehouse itself. I'm thrilled (and a little surprised) to report I didn't see a single pile of nuts, nor poo, nor anything else untoward. It looked precisely as we'd left it at the end of fall -- and even with having left the door to the porch wide open, no less. Perhaps the critters thought it smelled too much like people, or cedar, or whatever. Or maybe leaving the porch door open made it less inviting. Whichever, it looked great. I came back down to get some lunch and the camera, and then this blew in. Brr!! So, sorry, faithful Treehousers, we'll have to wait a bit for the video I've been promising. Spring will come!